Our cities are huge networks of solar energy collectors, as our buildings literally bake in the sun all day. While solar panels are increasingly being installed on rooftops to capture and distribute the energy produced by the sun’s light, very few people have found ways to turn them into exciting design elements. Urban Tiles, which is the graduation project of Meidad Marzan a student atBezalel Academy of Art in Jerusalem, hopes to turn solar panels from passive radiation collectors to active participants in the architectural dialog of any city. Urban Tiles are the triathlete of solar panels. Capturing solar energy, as well as blocking sunlight during the day, these swiveling photovoltaic cells could be used as an entertainment screen at night, allowing you to watch TV shows or movies off their interior surface. 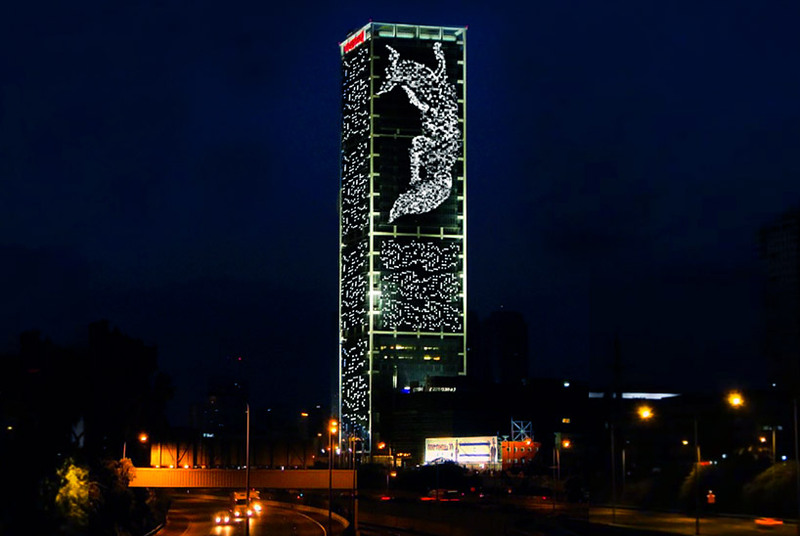 As you can see from the video, Urban Tiles can make buildings “dance” at night, when their sotred energy is released in patterns which can be easily programmed, or controlled with a touchscreen as Marzan anticipates. Similar light shows are common in cities around the world, but do any of them generate the electricity they need to operate? Didn’t think so.